“Could be,” The Doctor answered her. “And if she isn’t, I am. Come here, I’ve got a present for you.” He reached into his pocket and she saw a flash of something silver before he reached around her neck, under her long black hair. She felt the cold of metal, and something else, warmer, against her throat. When he stood back she looked down and felt the silver chain with a huge animal tooth fixed on it - what could definitely be called a fang. “Ok,” she said. “Cool.” She put a lace shawl around her shoulders and reached to take his hand as he offered it to her. He, despite having a room the size of a small department store full of clothes, was in his usual pinstripe suit. Or one of them. There WAS a rack of them in there. She had never seen him wear the same shirt twice, and he varied his neckties or sometimes went without one, as he was today, his throat attractively exposed, but he always wore that suit unless circumstances dictated otherwise. Fifty years from now she could close her eyes and still picture every detail of him in that suit with the canvas shoes and the tan overcoat that was lying across the rail by the door, ignoring the coat and hat stand right beside it. He picked the coat up as he passed and slipped it on. They stepped out onto the lovely planet of Te-Fot Quartus, just outside the grand entrance to its famous intergalactic zoo. “Is that the wolves?” Susan asked as she looked at the frieze above the entrance in which various animals had been picked out in bright, larger than life paintings. “That’s them,” The Doctor answered as he stepped up to the turnstile and paid for two day tickets. Inside, he was assailed by the various scents of a fifteen square mile parkland filled with hundreds of different animals. His sense of smell, like all his other senses, was much more acute than that of Humans, or indeed most Humanoid species. The pervading odour of animals that, while not necessarily unpleasant was not exactly a fine perfume, either. After a few minutes acclimatising, though, he could pick out the different scents. “The Pazithi Wolves enclosure is in the west quarter,” Susan told him, looking at the interactive plan of the zoo that she had been given as they passed through the turnstile. It opened up like a map, but it was more like a paper thin computer screen. Touching areas of it started off synthesised voices telling her about the various animals and their natural environments. She tried NOT to touch it if she could help it. She would rather go and look at the animals. “Best way to see everything is the monorail.” The Doctor pointed to the station where an open topped ‘train’ was loading with passengers. He grinned and led her to the back seat of the last carriage, far enough away from the woman at the front who was getting ready to deliver the usual routine of tour guides everywhere. Susan was willing to bet that The Doctor could tell her way more interesting things about most of the animals here. She was right. The Doctor kept up an enthusiastic commentary as they moved at a little more than brisk walking pace past, and sometimes through or over, each of the enclosures where the prize exhibits were on display. Several times they jumped off the monorail to take a closer look at particularly fascinating animals and caught the next one. After a few hours the tea room attracted them away for a while. Susan enjoyed herself thoroughly and she was sure The Doctor was having a good time, too. And that didn’t happen often enough, she thought. After their refreshments, Susan told The Doctor she didn’t mind if they headed for the wolves now. “You REALLY want to see them, don’t you,” she told him. His voice trailed off as he tried to find a way to express his feelings. The thought of seeing animals who belonged on his planet excited him nearly as much as a comfort parcel of Gallifreyan chocolate bars. He looked as if he was actually smelling them out as the monorail slowly approached that section of the zoo. He stood up and balanced on the edge of the open car, holding onto one of the spars that supported the canvas sunshade roof and looked hopefully around. Finally he gave a cry of delight and jumped straight off the car. Susan waited for it to stop and alighted in a more dignified way as she went to catch up with him. He was frowning at the information panel on the railing at the top of the deep, landscaped pit where the wolves were safely housed. “Fang is the pack leader, recognised because he is bigger and more muscular than the other three males, Rex, Gypsy and Pal. 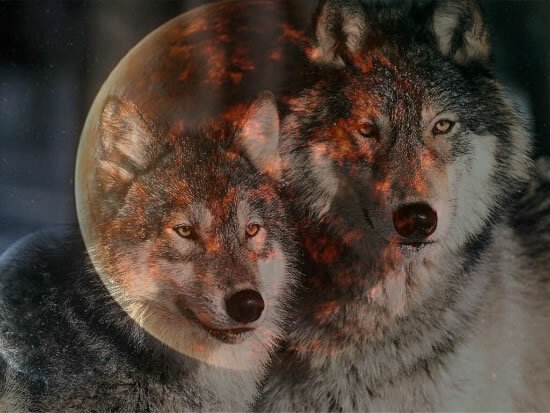 Pepper, the strongest of the females, is his primary mate, along with her sisters, Cassie, Nina, Lulu and Lola.” As he read, holographic pictures of each of the named wolves appeared above the panel and it was possible to pick them out from the real wolves in the pit below. “A wolf called Lulu?” Susan queried. He muttered something under his breath that sounded a bit like swear words as he pulled his sonic screwdriver from his inside pocket. Susan watched as he applied it to the panel. 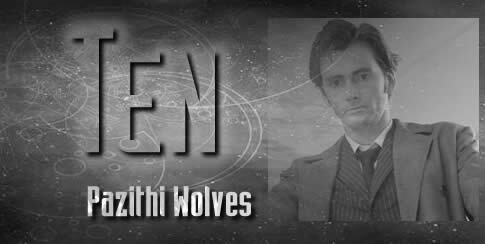 He replayed the information and the wolves now had their Gallifreyan names. Susan pulled the map from her pocket and touched the relevant section. She was not at all surprised to find that the information now included those new names. She looked down at the one now called Romana. The beautiful creature glanced back at her and gave a low but insistent growl. “Oh yes,” The Doctor replied. He smiled a distant smile as he related to her how a pack of these wolves actually lived on the boundary of his family estate. They were regarded with a healthy respect by all who lived and worked there. The wolves kept their distance from the people, although there were occasional accidents. He told of how one of his own ancestors had lost one of his lives through being mauled by one of the wolves. “Bad wolf,” he said cryptically to himself in one of those moments Susan knew she WOULDN’T get an explanation for. And yet, it almost seemed as if the wolves knew him as a closer kin than any other creature in the zoo. As he looked down at them, one, two, then three looked up at him. One of them separated from the pack and came as close as it could get. The Doctor gave a soft sigh as he actually made eye contact with the beautiful animal. “Mind you…” he added. “I could be wrong. I think.…” Then to Susan’s alarm, though not entirely to her surprise, he vaulted over the railing and dropped down to the wolf enclosure, landing lithely and with only a slight wobble. The wolves all turned to look at him as he stood very still and quiet, one hand held out in front of him, palm down, long fingers spread out. The pack leader, now identified as Rasson, moved towards him. He stood his ground until he could reach out and touch the thick, soft mane. Susan watched in astonishment as the pack leader turned its great bulk around and sat next to The Doctor, like a well trained pet dog. The lead female, Romana, came to his other side. The rest of the wolves closed in a rough semi-circle and lay down, their heads erect but their bodies at rest. The Doctor slowly knelt between the two lead wolves, his hands still buried in their manes. “Hey!” somebody cried out. “Look at that man. What’s he doing?” Susan quickly found that she was no longer standing there alone. A crowd gathered, exclaiming at The Doctor’s apparent ability to commune with the wolves, some declaring that they couldn’t be that fierce after all, and they must be trained animals. But unsurprisingly, that didn’t work. Moments later security arrived in force, including a man with a tranquilizer gun. “Move away from the animals very slowly and with your hands in the air,” the zoo keeper called to The Doctor as the man with the tranquilizer gun and four more guards made their way through the secure gate and down into the wolf enclosure. Slowly, he withdrew his hands from the two wolves and stepped backwards away from them. The wolves stayed exactly where they were until he reached the steps and turned to face the security guards. Then they began to move towards them. “Get back up the steps,” he ordered. The man with the tranquilliser gun raised it but The Doctor reached out to him, his arm a blur, and the gun fell in three broken and twisted sections, onto the steps. “Move, now,” he ordered and pushed them up the steps in front of him. As they emerged at the top and The Doctor slammed the gate behind them, the lock automatically engaging, it occurred to them all that they were meant to be taking The Doctor into custody. They turned around and arrested him. One of them took Susan by the arm. She sighed and came quietly. The Doctor grinned as her words brought him back from his far place. He smiled again as he remembered the feeling of being a wolf, of being able to run for hours across country in the cool of a moonlit Gallifreyan night. It was a bittersweet memory. “Did you tell them that Gallifrey is gone?” Susan asked. Although she was worried about what was going to happen to them both, she had enough compassion in her to wonder about such things. Susan wondered how he stopped himself going mad in those circumstances. Then she remembered that he had climbed into an enclosure full of wild wolves and wondered if he wasn’t slightly mad anyway. Then she thought she would rather go mad with him any day, than be with all the sane people in the universe. They both heard the sound of the door being unlocked and a man in a smart suit came in, accompanied by the keeper who had first raised the alarm and the head of security. The suited man dropped the confiscated contents of The Doctor’s pockets on the table; his sonic screwdriver, TARDIS key, a sticky packet of sherbet lemons, length of shoelace, a haircomb and his psychic paper. The Doctor glanced at the last as he picked it up and giggled before handing it to Susan. She had to bite her tongue to stop herself laughing out loud as she read the credentials of one Doctor John Doolittle, Department of Zoology, the Prydonian Academy, Gallifrey. “Sometimes things aren’t what they appear to be,” The Doctor answered, suddenly wary. “Appear?” The Doctor winked at Susan as he put on a perfect performance of a VIP visitor who had been slighted and insulted and talked about contacting his lawyer about the wrongful arrest. Isthen seemed to have forgotten that The Doctor was the one who jumped into the wolf pit and tried to mollify him. The Doctor looked as if he was dubious about it at first, then slowly accepted the offer. “Very well,” he said. “Susan, my dear….” He held out his arm to her and she came to his side. Isthen led them outside to an open topped electric car which brought them to the Research department. “Female intuition?” The Doctor asked with a faint smile. “Either way, I think you’re right. I’m going to keep an eye on him.” He put his hand on hers and squeezed it. The Doctor kept up a conversation with Isthen about his hopes for a successful Dorlian Sand Dragon breeding programme. Susan looked up the Sand Dragons on the souvenir map and the information she got about them made her wonder why anyone would WANT to breed them. When she saw them in the flesh she was even less enchanted. The same was true of the Aculaun tree spider. She was quite sure the extinction of something the size of a dinner plate with that many hairy legs would not unduly upset the balance of universe. “The work we are doing here is far more sophisticated than merely cloning,” Isthen argued. “It is a brand new technique of genetic manipulation and it is the only way to recover species that ARE extinct,” Isthen argued. “For example, let me show you….” He brought them to an enclosure in which a huge snake was curled up around a tree stump. It was as thick as a tree, deep red in colour except for a bright yellow diamond on the head, the point of it between the two bright looking eyes that opened and gazed back at them with what Susan thought was an almost intelligent expression. Isthen made a pretence of being concerned, mentioning that many of the species in the research facility were dangerous or poisonous. But a search by security established that Susan was nowhere in the building. At least not in any room that wasn’t secured by coded locks like the one with the cryptic sign on it that said ‘Special Projects’. The Doctor had wondered about that room already. There was something about it that felt wrong to all of his heightened Gallifreyan senses, but Isthen had moved them both away quickly and brought them to look at his collection of hand bred Isuthi Dwarf Monkeys, one of the few species in the facility that Susan hadn’t taken an instinctive step back from. One of the security guards came up to Isthen and spoke to him quietly. “Yeah, right,” The Doctor said, but under his breath. He would have gladly turned down the offer of a lift from Isthen’s ‘man’ but he was anxious to reach Susan and get her back to the TARDIS. She was sitting in the medical centre when he got there, looking dazed and confused and unable to remember exactly how she got there. The Doctor said nothing, but took her by the arm and gently brought her out to the car. He kept his arm close around her in the car and as they walked out through the main gate to where he had left the TARDIS. She said nothing as he guided her to the TARDIS kitchen. He sat her down on a chair at the table and looked for a packet of tea. He kept talking as he boiled the kettle and prepared the teapot, aware that she was not answering him, and knowing that was wrong, but hoping that the answer to it COULD be as simple as a hot drink inside her. He heard her move and then the fridge door opening. She backed away from him, snarling like an animal with food it has no intention of giving up. When he approached again she swiped him with her hand held like a claw and when he still kept coming she took the steak from her mouth long enough to sink her teeth into his arm instead. “Ok,” he said as she dropped to the floor, continuing to gnaw at the meat. He pulled the sonic screwdriver from his pocket and adjusted the setting. Keeping out of range of her teeth he shone a blue pulsating light in her eyes. At first she didn’t seem to want to focus on it, but it proved irresistible. She dropped the half gnawed meat as she fell into hypnotically induced sleep. He carried her to the medical room and laid her down on the examination table. A simple examination of her eyes and mouth gave him a strong suspicion of what was going on. A more detailed body scan told him the rest. A simple blood test confirmed it. “Two can play at that game,” he murmured and then he rolled up the sleeve of his shirt and jacket. He took a clean syringe and extracted a half pint of his own blood. He injected it into her arm. Then he picked her up again and carried her BACK to the kitchen. He sat her down on the chair and carried on making the tea. She broke off. Her face screwed up with the effort to remember. The Doctor put his hand on her forehead. He felt her memories. She couldn’t remember because they had drugged her, but her subconscious mind saw and heard everything. Or heard it at least. She had been blindfolded and gagged and pulled down on a table. Somebody had scanned her body and said she would do for the wolf project. She had felt something injected into her arm and then a hot sensation as if some kind of ray had been passed through her body. Then somebody had shouted. There had been an argument. Somebody said that she was WITH the Gallifreyan. If she disappeared he would make difficulties. There was another sharp feeling of a syringe in her arm and it all went black. “Oh I don’t doubt that,” The Doctor assured her. “I just glad I got to you in time. I wonder if they intended.…” He stopped and looked strangely guilty. “WHAT did they do?” she demanded, making no promises. “WHAT! No. Oh MY GOD! I’m turning into a WOLF!” When he made the list of things he didn’t want her to do, he should have added ‘don’t scream’. He put out his hand and touched her forehead, gently calming her. It took a while. She didn’t want to be calmed. “I just feel hungry at the moment,” she replied, telepathically, before she even realised she was doing it. “Oh my….” The Doctor grinned and went to the fridge. He pulled out a plate containing the second of the two steaks that had been earmarked for supper. She took one look and asked if he could knock up a nice cheese omelette. It wasn’t telepathy that made them both think the exact same thing in the same moment. The Doctor shuddered too and his hand shook as he turned the omelettes onto a plate. She ate. The Doctor did too. For a little while everything seemed quite normal. Eating omelettes in what seemed to be a quite ordinary kitchen. The normality of it was soothing. Susan almost managed to forget that they were in the middle of another strange adventure. “Who is Tegan?” she asked. “I can’t even take you to a zoo without a nutcase trying to change your DNA,” he said. “Ok,” he said. He grinned widely at her. “Let’s do it.” He picked up the empty plates and dropped them in the sink before bounding out of the kitchen and back towards the console room. Susan caught up with him only a little more slowly. He was right. She DID have some of his energy. And, she thought, maybe just a bit of his enthusiasm for the adventure, the thrill of the chase. “The zoo is closed. It’s dark outside. Let’s go snooping Time Lord style.” He grinned again and punched in a coordinate to bring the TARDIS inside the zoo. He was not grinning, but was deadly serious when he strapped the heavy looking antique sword in its leather scabbard around his waist. It was strange to see him carry a weapon. It looked wrong anyway with a suit jacket and it was just WRONG for HIM somehow. But when she thought of going back into that place she was glad to see him relax his pacifist principles. “You would be safer staying in the TARDIS,” he said. To her surprise, it wasn’t the research facility that they materialised in first. “The wolf enclosure?” Susan looked on in surprise as The Doctor stood at the open door and let a low whistle from his lips. In the darkness beyond she saw two shapes moving, and he stood aside as the two largest of the wolves, the alpha male and his chief mate, named Rasson and Romana by The Doctor, calmly walked into the TARDIS and lay down like two large pet dogs. Susan wasn’t arguing. She just wondered if The Doctor’s surname really WAS Doolittle after all. “No,” he assured her with a grin as he moved the TARDIS again, this time materialising in the Research facility. It was quiet, with low level night lighting on. The Doctor had an idea there would be security guards of some kind, though. He was right. As he and Susan stepped out of the TARDIS a torch was shone in their faces and they were ordered to put up their hands. The Doctor gave the same low whistle and the wolves walked out. There were four thunks as the guards dropped their weapons and their torches. 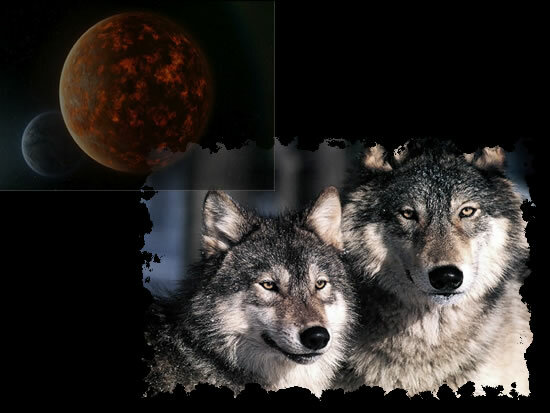 Susan nodded and walked with him, the two of them flanked by the wolves. He was heading, she noted, to the Eruduian Anaconda. She didn’t want to get too close. Neither, she noted, did the wolves. Their instinct was to back off, whimpering slightly. The Doctor stepped closer. The Anaconda moved nearer. Even in the low light, its eyes seemed bright and alive and suspiciously intelligent. Susan felt The Doctor’s mind reach out to the creature. He didn’t use words, but rather something like emotions, using them to convey a message. And he got one back. Susan understood the message as clearly as he did. The creature was pleading with him to end its nightmare. “I am so sorry,” The Doctor whispered out loud as he raised his sword. Susan closed her eyes as it came down with a sickening, slicing sound. She FELT the creature’s gratitude to him in its last moments. “Let’s get into that locked section,” The Doctor said, turning from the sad corpse of the Eruduian Anaconda or, what was, in some small part of its DNA, the luckless Sam Watson. Either way, he didn’t feel as if he had just killed in cold blood. Rather, it had been an act of mercy. He could not have brought the Human being back. The DNA mutation was too far gone. The animal that replaced him was a tortured creature that knew instinctively that its existence was wrong. He dreaded what he would find behind the locked door. And when he got it open, with the sonic screwdriver’s handy lock melting tool, his worst fears were realised. “You remember it now, don’t you,” he said to her. It WAS horrible. The Doctor stared in near disbelief at the collection of pitiful chimera in tanks and cages on every side. The unsuccessful experiments – at least unless Isthen was intending to create animals that still retained Human limbs or enough sentience to cry out in despair for what they once were and the monster that they had been made into. Susan shuddered as she looked into the first cage and saw eight hairy legs, a bloated abdomen and Human eyes in the head of a spider at least six feet tall. The Doctor didn’t even hesitate before killing it. They were both sure that its dying cry was one of relief rather than pain. He went down the line of awful mutants and brought quick, merciful death to them all. Some of them actually had enough sentience left to thank him. He wasn’t sure which seared his soul the most - those ones who were able to assure him he was doing the right thing, or the ones who had been so badly mutilated that they knew nothing about it. Susan didn’t even question his actions. She understood that this had to be done. She wanted him to do it. “I would never have let it go that far,” he told her. “Thank you,” she answered as she watched him decapitate something that might have been another anaconda if the procedure hadn’t gone badly wrong. The eyes that died last of all had a grateful expression. “Doctor… over there.…” Susan whispered loudly. But The Doctor had already heard the sound and was moving towards the place. There was an operating table of sorts. In Susan’s mind a subconscious memory told her that she had been there earlier. There was a man fastened to the table. At least he had STARTED off as a man. Now he was already starting to look like a wolf. As well as Susan’s revulsion at the sight of straight Human limbs contracting into those of an animal, of fur growing over white flesh, fangs in a jaw that was starting to elongate, The Doctor felt the two real wolves recoiling from this half-creature. They growled low and menacingly. “Help me,” the part of it that was still a man begged. The Doctor looked at him and began to raise his sword. Then he stopped. Was this man far enough gone, he wondered? He reached and touched him on the forehead that was beginning to recede as the bone structure altered. Yes, there was still a lot of Human in there, still. He kept getting flashes of wolf behaviour, of the need to eat freshly killed meat, and a poignant memory of a big moon that told him that it WAS Pazithi Wolf DNA that had been used. But there were still stronger memories of being Human. There was anger at the betrayal that had led to his being brought here as one of Isthen’s experiments, fear that it WAS too late, and HOPE as his still Human eyes met The Doctor’s. “I don’t know,” The Doctor told him. “Maybe.…” He glanced at the intravenous drip attached to the arm that was becoming a wolf limb. He reached and detached the plastic bag of, he presumed, condensed wolf. The equipment could be converted to take a blood transfusion. He set to work quickly, rigging it. Susan helped him without questioning his judgement except once, as she watched his blood being transfused into the victim. “Yes, in a minute,” The Doctor said as he closed off the transfusion at last. “Can you tell me who you are?” he asked. Yes, there WAS a change already. The jaw was slowly receding back to Human, and some of the hair was falling out. “Fynur Isthen, junior,” he answered slowly, and painfully. “You’re going to be all right now,” Susan assured him. “The Doctor has helped you. It did work, didn’t it?” She looked hopefully at The Doctor. He put his hand on Isthen Junior’s forehead. The race memory of the moon was gone now. So was the urge to tear at raw flesh, though he was still very angry and hurt. “You are the one who committed murder, Doctor!” The lights suddenly turned on. Bethar Isthen stood at the door. He was flanked by the two guards, released from their cuffs, looking humiliated and ready to get revenge for that humiliation. “You murdered my creations,” he added as he drew closer. The two guards drew their weapons and levelled them at The Doctor. “You murdered people to create your… creations,” The Doctor answered wishing he had started that sentence better. It sounded stupid the way it came out. But this was no time for clever prose. “It’s still all about money!” There was a tone of disgust in The Doctor’s words. Then he stopped speaking. He half-closed his lips and made that low whistle again. Rasson and Romana hunched and tensed their strong muscles and leapt into the air. The two guards screamed in terror as they found themselves pinned to the floor by several kilos of wolf. To The Doctor’s surprise, as it was not part of his plan, Isthen junior had also responded to the animal call. What was left of the wolf in his limbs gave him the impetus. His uncle screamed as he was brought to the ground. Humans, The Doctor noted, could be even more vicious than animals when the urge for revenge was in them. It wasn’t the wolf in Fynur Isthen junior he had to appeal to. That he could control the same way as he urged the two wolves to take out the guards without killing them. But he had no control over the Human that was quickly gaining ground over the animal. He had to hope reason would overrule revenge before he actually throttled Bethar Isthen. “You’re not worth it,” Fynur Isthen junior said as he stood up and backed off. The Doctor gave a soft whistle and the two wolves also backed off, sitting either side of Susan and Fynur as The Doctor stepped forward and again told the two guards to cuff themselves, this time to their boss as well as to the nearest immovable object. “Let’s go and sit out in the fresh air while we wait for the police to arrive,” The Doctor said. “Fynur looks like he needs it. And I think its time Rasson and Romana went back to their pen anyway. Things happened quickly after that. By the time the sun came up on a bright morning on Te-Fot Quartus both of the senior Isthen men had been taken into custody. The research facility had those yellow tapes around the door saying ‘crime scene’ that were the same anywhere in the universe and the zoo was closed pending the arrival of a temporary director to take over its legitimate operations. Fynur Isthen junior was hopeful that the new administration might still have a job for him. But mostly he was happy to be alive. “I can’t thank you enough, Doctor,” he said as they stood by the wolf enclosure and watched the two biggest and strongest split from the pack and come towards where The Doctor stood, lying down in deference to him as their alpha male. He winked at Susan and she smiled back at him as he vaulted over the gate and bounded down to the wolf pen.